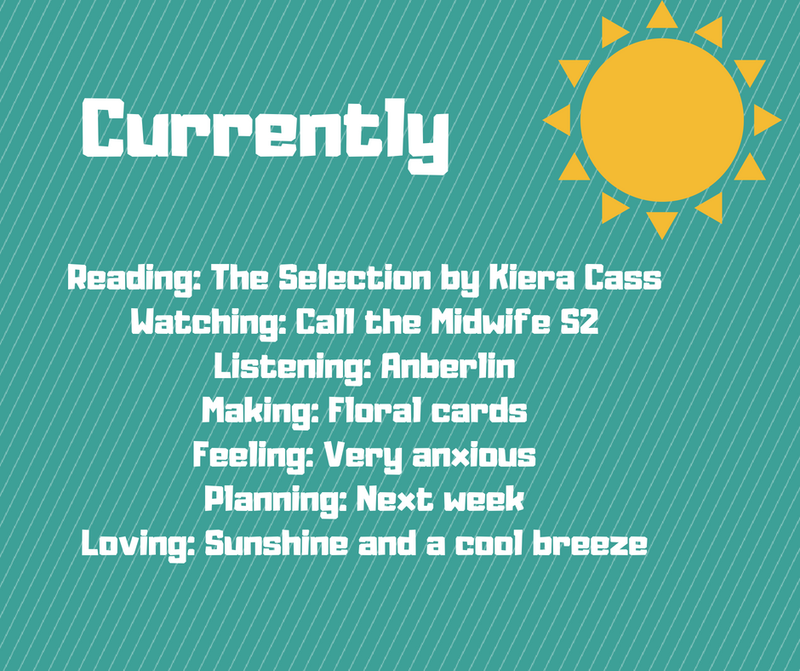 Reading: I finally started The Selection by Kiera Cass. A fluffy romance was just what I needed this week. Watching: Along with my fluffy romance, I needed some feel-good television. Call the Midwife S2 is perfect for this. It's serious, but always makes me feel good at the end. Listening: After marathoning Black Veil Brides for Arthur, I randomly pulled up a much loved older album: Anberlin's Cities. I sang along to every song. Making: Working on some floral cards for this month. I'm thinking that may be my theme for the next class I plan. Feeling: The twins arrive tonight and I am so anxious. I will be super anxious until I get the text that they have landed. Planning: Working on our plans for next week - activities and meals. Loving: This past weekend was really hot (over 90 degrees both days). The temps are back in the 70s with sunshine and a nice cool breeze. Loving it!